With the show hanging at Fonthill, I’m in a Fonthill frame of mind. I went back to look at some images captured in the beginning of this year and stumbled upon this one. I’m preparing for two upcoming webinars. One for Topaz next week and the other for Nik at the end of the month. The preparation is always fun, forcing me to try new things and or find images that will work well for teaching. For this image, I used Nik Color Efex to enhance the color version and then Silver Efex Pro for the b&w work. Back into color Efex for some finishing work, specifically the darken lighten center filter. just love this, the open grate is a tremendous addition and adds to the perspective!! Love the mystery in the dark corner, JB! The LDC often yields a magical finishing touch. Love this image. 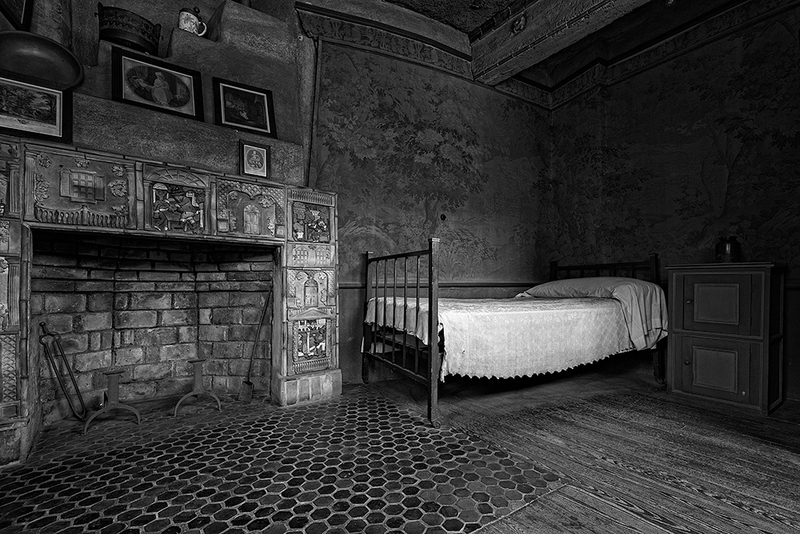 When I got to see this room there was an absolutely wonderful shadow of the window falling across it. I spent almost all of my allocated time for that section of the tour taking images for stitching. (I think they wished they had a cattle prod to move me) Unfortunately…I didn’t do it correctly. My “Award-winning image” turned out to be an also-ran. Ahh well. One of my favs of your images! Wish Fonthill was not so far from California. Have a great show, John!